Gupta, Meet me in Lerner's Courtyard. ASAP. Khushi sighed. Ever since she had read Anjali's patient file she had been consciously avoiding him, unable to come to any definitive conclusion about the matter. It hadn't been hard really, what with her busy schedule and his ridiculous work ethic. But now, after a week, it seemed his patience was wearing thin. As much as it would be easier to make an excuse about work and elude him, the fact of the matter remained that she had missed him. A revelation that both surprised and worried her. Taking a quick break, she wrapped herself up in the hospital provided wool jacket, scarf and beanie. With her hands stuffed in her pockets, Khushi's teeth chattered loudly as she trudged through the layers of soft slush on the ground. The courtyard was empty save for a lone figure, huddled over on a bench. White snow blanketed every surface; the bitter cold had bullied everyone to stay in doors. Still here they were... two crazy individuals, battling the elements, just for a moment alone. Arnav stood up as she walked toward him. Handing her a coffee, he quickly pecked her on the lips, his muscles too frozen to manage much else. 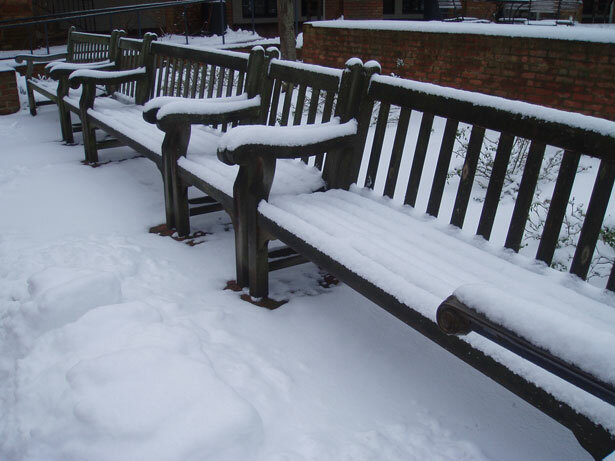 Leather gloved hands brushed away the snow on the wooden bench and he beckoned her to sit next to him. Wrapping her hands around the paper cup, Khushi took a long sip, letting the warm liquid thaw out her insides. Tufts of steam escaped through the thin slit in the lid; ribbon like twirls vaporising in the cold air. It was eerily silent, the occasion whistling of the breeze their only companion. "You could have come inside you know." Sighing, she leaned against his arm. "And now we are freezing...alone." Khushi couldn't help but smile as her eyes fluttered shut. "I missed you." For a second, he couldn't help but being taken aback by her confession. It wasn't often she was so candid. Touching the corner of her lips with his own, he nuzzled his nose against her cheek. They sat a little while longer on the wet benches, taking comfort from the embrace. Some time during the silent contemplation, a loud bark like cough erupted from Arnav's chest, echoing out into the empty courtyard, as he struggled to breathe. Khushi sat up in alarm. "Arnav! What's wrong?" She rubbed his back, trying to ease his pain. "Jesus Gupta relax. It's just a cough." Arnav managed to gasp in between breaths. "Shut the hell up. Last time I checked you didn't have a doctor's degree. I can hear the phelgm rattling around in your chest." Arnav could see the concern trickling from her eye's. He shook his head. "You and my sister both." Khushi's reaction watered down a little at the mention of Anjali. Still her fingers remained intent on unbuttoning his coat and shirt. "I need to listen to your chest. I can't believe you are sitting out in this cold. There has to be a limit to irresponsibility. "She muttered. Arnav grinned. "If I had known you were this eager to get my shirt off I would have pretended to be sick a long time back." Khushi pushed him away in anger, folding her arms across her chest and pouting. Chuckling, he put his chin on her shoulder and wrapped his arms around her waist. "It's just an infection. My sister already prescribed me the antibiotics. Look at the weather...everyone's sick. So relax. Let her be my doctor ok? You..." he lightly nibbled on her earlobe...."just concentrate on being my girlfrie..." Arnav stopped mid word, realising the impact of his unintended confession. Khushi became stiff in his arms and he quickly sat up, trying to appear as nonplussed as was possible. She turned toward him fully, a poorly concealed smirk on her face and mischief gamboling in the pools of her eyes. "Girlfriend Raizada? I never remember you asking?" Finding something very interesting to look at upon a leafless tree he shrugged..."Well since you broke my nose I figure that you owe me." "Uh-huh." he said, fiddling with the dials on his watch. "You know Gupta you're just damn lucky you didn't break anything else. I would have made you my wife." That shut her right up. Standing up she squeaked, her breathing visibly laboured and her button nose bright red..."I've got to go." He laughed watching her jog/walk back inside. "Are you done?" Shagun poked her head from a patient's room calling out to Khushi. "Yeah...I was just going to check the pH of 25B, then head home. You need something?" "Nah...you've just been looking a little lost. Thought you might want a chat." Khushi hesitated, debating on whether or not she should share her troubles. Her breath hitched for a second...."Can you talk now?" Shagun peeked behind her, to see Ms. Thomas fast asleep. "I was supposed to change her dressing's but it can wait." Stepping out, she squeezed some alco-gel, rubbing it thoroughly on her hands. "Ok spill." "Right...stupid question." she mumbled. "Well Parker asked me for a consult the other day. The long and short of it all is that the patient is his sister. I'm bound by confidentiality, I can't tell him and I'm not sure he knows. What am I supposed to do? If he finds out that I knew about his sister and didn't tell him.....I mean it's breaking his trust." "Ok whatever I was expecting you to say. It wasn't that." Shagun admitted, a little shocked. "So....I don't know." Her voice increased a notch in it's pitch. " Don't you guys study ethics?" Shagun asked exasperated by the situation. "Yeah and I'm not supposed to tell him. But that...that bull!" "Why don't you just hand over the case? Tell Parker you have a conflict of interest. He'll understand." "I'm not sure he will." "Whether he will or not is not the point. It's just too tricky." "What if Arnav thinks that I didn't care about his sister?" Shagun groaned..."Do you care about his sister?" "I care about him." she admitted quietly. Momentarily forgetting the quandary Khushi was in, Shagun engulfed her friend in a hug. "I'm so happy for you." Nothing more was said. Khushi loved that about Shagun. She understood Khushi's private nature and didn't prod any more than she was comfortable. "You're stuck both ways. Why don't you talk to his sister? Try and figure it out with her. Meanwhile do everything you can for Parker and then handover the case." "I don't want to lie to him. I guess that's the best I can do." Though spoken aloud, these statements were mostly for Khushi's own benefit. "Thanks...I feel better." "Khush....is she in a bad way? His sister?" Khushi sighed wearily and nodded. "Yeah..."
This day, like every other day in Dr. Gupta's life, had been exhausting. Opening the locks, she quickly brushed her feet off on the carpet and slammed the door shut, lest her house become any colder than it already was. One step at a time, she trudged her way upstairs fully prepared to soak herself in a warm bath till her skin resembled a prune. Upon entering her room she made a bee line for the bathroom. Out of the corner of her eye, she saw the figure of another person in her room. Frozen in shock, she slowly turned around, her heart thumping loudly in her ears. Lying in the middle of the bed, tucked under the covers was Arnav Singh Raizada...snoring. Khushi almost fell to the floor in a heap from the shock. Her first instinct was to go over and beat the living crap out of him for scaring her. That feeling however was drowned out by the most obvious question...how the hell did he get inside her house in the first place? Taking a minute to calm her breathing, she then walked over to him. Coughing loudly, he grimaced in pain and turned on his other side to make himself more comfortable. The covers slipped downward and immediately Khushi's cheeks flamed red. Chiding herself for her immaturity, she checked his forehead for a temperature. Her eyes however could not help wandering to the expanse of skin that found itself exposed. For once his hair sat messily atop his head, the unruly mass falling across his forehead. Unjustly long lashes softened his hard edges, endowing him with boyish innocence. Sleeping on a heap of pillows, he kept rubbing his nose in his sleep. On the dresser was a pile of used tissues, while his clothes lay discarded upon her reading chair. Khushi felt a maternal instinct that was unfamiliar. Tiredly she picked up a plastic bag and put all the used tissues away. Tucking him in properly she leaned down to kiss his lips gently. Arnav held onto her hand and pulled her beside him. "No." he mumbled sleepily, cuddling her close to him. Spooning her against him, he swung his leg over her. "Arnav what are you doing? Let me go!" "This is what girlfriends do Gupta." "Act as personal teddy bears." "If I had known you were such a woman Raizada...I would have never let you come in my house. On that note...how did you get in?" Arnav yawned waking up slowly. "You're so predictable Gupta. You know that right? You're spare key was in that weird looking froggy thing beside your front door." "I need to find a better hiding place." Arnav kissed her cheek. "You do." Tired as hell she let herself relax into him. "But why are you in my bed?" "I thought I explained this Gupta. You are my girlfriend. Girlfriends are personal teddy bears." "How remiss of me." Her sarcasm obvious. Yawning loudly she turned around and snuggled into his chest, playing with the wiry tuft of hair in between his pecs. "You know Raizada if I had known that you had this body under those clothes I would have helped you pretend you were sick." Arnav grinned and let his eyes shut. Slowly they drifted off to sleep, too worn out to care about anything else. You guys are commenting fiends! I love it! I hope I am doing you justice with the relatively fast updates. This story will hopefully be finished in the next week or two. love this story. beautifully written. I giggled like a teenage girl throughout this chapter. It's ridiculous. Arnav and Khushi's relationship is heartwarming. Just the right amounts of mush and banter to balance everything out! loved the domestic bliss they settled into int his chapter. Awwwwww!!!!!! Love them! So what is poor Khushi going to do? Tell Anjali? Ok....so...um.....Arnav is the actual patient right??? Not Anjali....and you don't know it but I'm crying here...because I can just imagine what this story is gonna end like....Because you have let out that the condition is bad..critical. Every time I visit this site, I find two updates. So, I decided to comment on both. You know what I liked best about this update? The fact that Shagun had a good and realistic advice to offer. I think that's how it should be. oh my god they actually sat there on those benches to enjoy a moment with each other all alone and all she can say is that she cares for him!!!! it love my girl it love!!! he called her his personal teddy bear awwww shooo cute they are i hope they stay like that and away from all evils. i am being wistful? They are cute and adorable. Need s happy ending..please please can you do something.